The original homelands of modernity - Europe, the U.S. and their close cousins - account for 90 percent of the world’s top 200 universities in the new Times Higher Education rankings. Developing nations are trying to catch up, but this cultural advantage is likely to persist. Top U.S. law firms are offering $280,000 signing bonuses to lure the best young lawyers. But many do stints with the government first. A new Breakingviews calculator shows how that path can be financially smarter over the long run. Uncle Sam gets to hire the best talent, too. 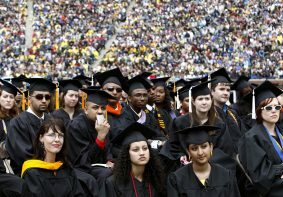 Goosing graduates’ employment statistics isn’t illegal, several courts have ruled. But it’s shameful nonetheless. With work scarce and tuition soaring, lawyer wannabes deserve honesty from institutions that teach legal ethics. Caveat emptor makes for a lousy school motto. The U. of Virginia’s president beat back an ouster supported by hedgie Paul Tudor Jones and a former Goldman Sachs exec. But victory may be pyrrhic. For Thomas Jefferson’s school to survive in a bleaker fiscal world, the paradigm shifts Teresa Sullivan resisted look unavoidable. Tuition at the likes of Yale and Stanford keeps rising faster than inflation, despite fewer aspiring lawyers in the United States. And job prospects for graduates are getting worse. Despite their advanced skills, legal educators haven’t yet mastered the law of supply and demand. Graduates are forking over far more in loan repayments than a decade ago, easily outstripping salary growth. Over time, that’ll dent GDP. Defaults are rising, too. With Uncle Sam now holding $450 bln of student debt and rising, that puts taxpayers on the hook - again. Disgruntled lawyers are suing their alma maters for exaggerating employment prospects. That seems fitting for a litigious lot with buyers’ remorse over a $120,000 education. A lousy job market isn’t the schools’ fault, but training these cheeky legal eagles may be. Mass protests over education mask a deeper divide over the post-Pinochet preference for market-based, rather than state, solutions. The Chicago Boys got it mostly right, but not on education. Resolving the current dilemma may require fundamental philosophical reform - and money. The fund’s flagship yearly outlook laments a jobs crisis and rising inequality in wealthy nations. But its prescription of more education spending is unlikely to do the trick. Though desirable in many ways, such outlays aren’t the golden ticket economists often claim.